Inlays can be used to cover cross bolt holes drilled for large caliber magnum	rifles, a bad spot on the stock, or for just having something fancy. They can	be	of exotic woods, ivory, metals or whatever. They can be of all the same	type material or a mixture that only the imagination could compose. Once I saw	a pool cue stick with diamond inlays. 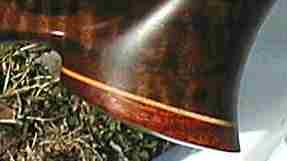 Before cutting the stock, practice inletting the inlay on another piece of	wood. This may prevent a disaster and increase confidence. Lay inlay on stock and trace the outline with a sharp tool. Inlet the inlay to	approximately 1/8 inch deep. Do not	pry the walls of the inlet with the cutting tool. Doing so will leave a dent	and the wood may split or splinter outside the pattern. The inlay should be	slightly angled so that pressing it in causes it to tighten against the	outline of the inlet, giving it a seamless appearance. Using glass bedding epoxy, epoxy the inlay into place and let cure. Do not mix	floc or metal aggregates that may have come with the bedding kit and let	epoxy cure at least two days before sanding. Sand inlay to stock surface. Remember to sand with the grain of the stock. You can put inlays in inlays and inlays appearing to over lap inlays (see	picture below). To do this inlet as described above but wait until base	inlay(s) has cured and been sanded to stock surface before cutting into it. To have inlays appear to overlap, as shown in the bottom most example below,	the outside inlays would be installed first. In the top two examples shown the	center inlay would be installed first. Some inlays and pieces for grip and tip caps. 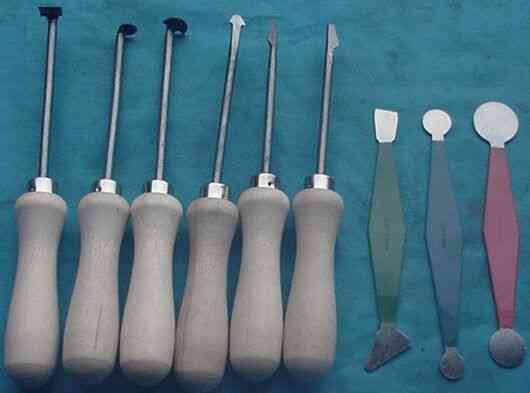 Some inletting and barrel	channeling tools. 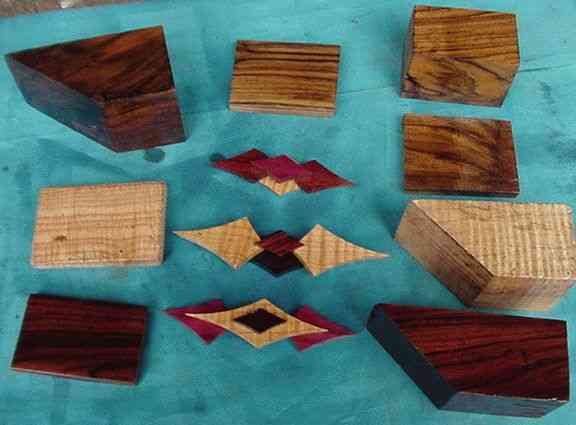 pictures are compliments of	Wright's Gunstock Blanks	who also sells this stuff. Tools are also available through	Brownells	and others. Although a tip piece can be installed at any stage before applying finish, it	is best to install it before inletting the barrel channel. A thin maple wafer is often used as a spacer for tip pieces and grip caps. Forend tips are installed 90 degrees or 45 degrees to the forend	of the stock. For a 45 degree cut the longest part of forend (not tip) is at	the top of barrel channel. The end of the tip being attached can be cut to	angle or not regardless of whether the forend of stock is cut 90 degrees or	45 degrees. The picture above shows three blocks cut 45 degrees suitable for	use as forend tip pieces. The face of block would be bonded to the face of a	45	degree cut on forend of stock. The block would then be shaped to lines	matching that of stock. Notice that one of the blocks shown is long enough to	have an angled cut at the end. The angle can be up to 45 degrees but must	angle opposite to that of the other (the stock will be longer at underside, not	at top of barrel channel). An angle less than 45 degrees is normal and causes	the rifle to act less like a brush hook as it is being carried through the	woods. I like to keep it around 22 to 30 degrees. Though, the stock cut	should be only a 45 or 90 degree cut. Rough the face of tip piece and forend, however be sure the face of both are	smooth at their extremities so that once tip piece is bonded and shaped no	marks will be seen at the bond. To bond, apply only a small amount of glass	bedding epoxy to entire face surfaces. Do not mix any aggregates that may have	come with the glass bedding kit. Use something to keep pressure on tip piece	so that no large bonding line will be seen when cured and shaped. Let cure for	at least two days. With flat files rough shape tip piece to that of stock	lines, finishing with a sanding block to 320 or 400 grit. Inlet for	barrel	. Cut tip end 90 degrees or angle. With flat files evenly round tip and	finish with a sanding block. A 90 degree and three 45 degree forend tip caps. Bottom pictures were scanned from	Richards Micro-Fit Stocks	catalog. Top left is from a stock I built. A wooden piece for use as a pistol grip cap can be bonded before or after the	grip is fashioned. A pre-fashioned cap, such as those made of metal, can be	attached and fashioned by filing and polishing to match the wood contour or by	matching the wood to its contour. Metal caps should be attached with hardware. Wooden caps can be bonded or attached with hardware. It is usual	for wooden caps to be bonded. picture of metal grip caps are compliments of	Wright's Gunstock Blanks	Metel caps are also available through	Brownells	.